“First , the head piece does not pop out and extend over Barry’s forehead like it does here. It’s a much more sleek design which looks to be built for speed. Through the golden streaks near the ears are close, they dont extend from the head. The cowl is also sectioned into thin lateral pieces, close to 10, which allow the costume to move comfortably but maintain a complex and high-tech look. 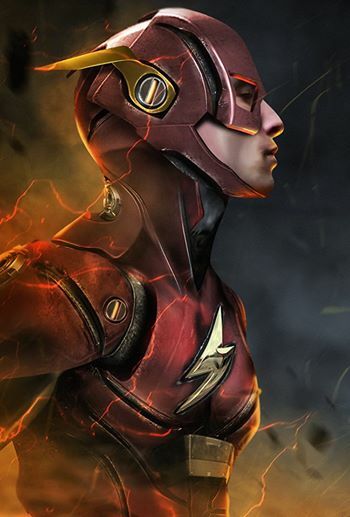 What do you guys think, do you like it or do you wish for more of what we have on the CW Flash? Let us know! Thanks to Comic Book Resources we have a second preview for Revolution #1, adding to the portion they shared back in August. So take a look at the first 12 pages, the book will be hitting shops next week! THANKS TO COMICBOOK.COM WE HAVE LEARNED THAT KEVIN SMITH WILL BE BACK NEXT SEASON TO DIRECT ANOTHER EPISODE OF THE FLASH! Marvel Teases "Divided We Stand"